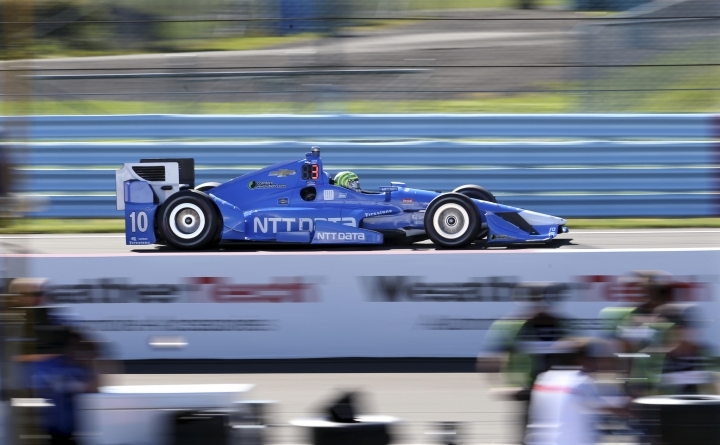 WATKINS GLEN, N.Y. — IndyCar racing returned to Watkins Glen International on Friday after a six-year hiatus, and New York's Thunder Road didn't disappoint as the teams practiced in earnest for the first time. "It's great to be back, great to be going around here," Helio Castroneves said. "This is the DNA of open-wheel racing, and the history behind this place. It suits perfectly the series." Most of the teams were permitted to test earlier for this weekend's race, which replaced a street event in Boston that was canceled. WGI was repaved after last season, and it created a smooth-as-silk surface with gobs of grip that opened a lot of eyes in Friday's two practices on a sunny day. In morning practice around the 3.37-mile, 11-turn layout, all 22 drivers eclipsed Ryan Briscoe's track record of 1 minute, 28.1322 seconds at 137.657 mph set in 2009 in a Honda V-8. Scott Dixon, a three-time winner at The Glen, topped the charts in the No. 9 Target Chevrolet in both sessions: he turned a fast lap of 1:23.8921 seconds at 144.614 mph in the morning session and 1:22.8740 at 146.391 mph in the two-hour afternoon session to edge Castroneves and Will Power of Team Penske. "There's no other track where you commit like here," said Power, second in the standings, 28 points behind teammate Simon Pagenaud with two races left in the season. "It's so different. There's no comparison. It's so much faster." Pagenaud's first extended time on the track in his career ended on a sour note. He was 11th fastest in the afternoon but crashed into a tire barrier in the waning moments. Watkins Glen was the birthplace of road racing in America after World War II. A 6.6-mile course using mostly paved roads with a short dirt and gravel stretch served as the layout for the first race at Watkins Glen in 1948. In 1961, Formula One came to The Glen and the race became a fall tradition, remaining through 1980. Financial difficulties helped lead to The Glen's departure from the Formula One calendar after Alan Jones won the 1980 race. The last open-wheel race of that era was the Watkins Glen 200, a CART event in 1981 — Mario Andretti started on the pole and Rick Mears won the race. For the next two years, the track was not well maintained. Then, in 1983, Corning Enterprises, a subsidiary of Corning Glass, partnered with International Speedway Corporation to buy the track and rename it Watkins Glen International. NASCAR has raced each year at Watkins Glen since 1986, and IndyCar began a five-year run in September 2005 before the track parted ways with the series when the finances didn't add up. The departure of open-wheel racing didn't sit well with track president Michael Printup, a devotee of Formula One, and when Boston organizers pulled out of their deal in May, IndyCar and WGI worked out a deal to move the race to upstate New York's Finger Lakes region. That turned into a three-year commitment when a two-year contract extension was agreed to last week, ahead of original plans to talk after Sunday's 60-lap, 202.2- mile race. The short time to promote Sunday afternoon's race means attendance won't turn any heads. It's a start, though, at the very least. "We're not going to hit a home run. You can't plan a birthday party in 90 days," Printup said. "We sold just under 10,000 tickets in corporate in 2010. We have 200 this race. It's too hard to call a company in June and say, 'Hey, our race is the first week of September.' Budgets are done. Even family budgets are done." The track sold all of its grandstand seats for the last two Sprint Cup races as sizable crowds streamed through the gates in spectacular weather conditions. Attendance figures are not released, but those two NASCAR crowds were estimated at around 100,000. Printup estimated the track would end up with 40,000-50,000 fans for IndyCar's race weekend, an average of around 15,000 or more per day. He said next year's race would be held the same weekend, but a 2018 date had not yet been agreed upon. "It might be the best weekend for TV," Printup said. "College football on Saturday, no NFL on Sunday. You want TV for all your sponsors, but you want your on-track attendance. I think if we give people a year to plan, this could be their family vacation next year." Just the thought of that left Printup wearing a big smile. "This is awesome. This is the place for those cars," he said. "They belong here. They need to stay here."